Looking for the very best in timeless landscapes? You have found one here. A semi abstract painting by Gordon Frickers, measuring 40 x 50 cm (15¾” x 19¾”), oils, available, £1,500.00, ex studio ex frame. You could purchase or commission a painting of this quality, phone, ask how. A bright dawn reminding us to live as if your story had no ending, to be fully in the present. Power painted in 40 minutes. To acquire this or commission a similar painting, a pleasure to own, a sound investment, you can purchase in easy stages. To make a purchase the easiest way is bank to bank, ask for details, or using PayPal via the Purchase Page. 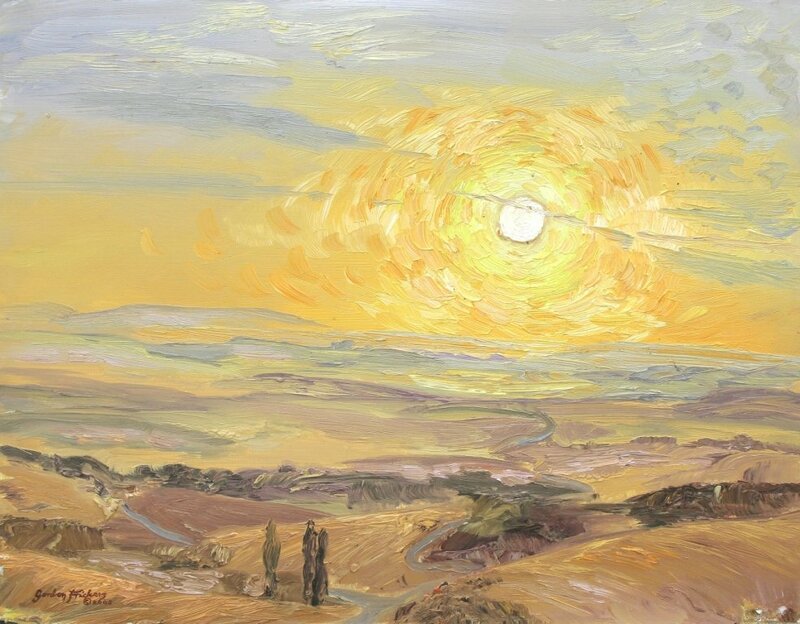 One of the ‘Sunrise Project‘ series which together with the ‘Sunset Project’ series shared our question, what happened when the artist painted what he saw as it happened, how would the colours, tones and composition reveal themselves? This landscape painting was produced from the same location as others in this series. This semi abstract landscape painting resulted from some very focused ‘looking’. Good preparation was essential for this series (to use a nautical phrase, PPP=PPP, piss poor preparation, piss poor performance…) as was being on location warmly dressed well before dawn.